You are here: Home / Blog / Wine with Winston / Rosé All Day!! When Mom and Dad came home from church on Sunday and had a dozen roses, I just knew they were for me. I had been such a good boy all weekend through all of our events, and at that moment I knew they had recognized my good behavior. Now I know not every dog wants to get a dozen roses, but I’m not just any dog. I’m Winston the wine dog and I am refined and distinguished, and I appreciate a bouquet of roses just as much as I appreciate a peanut butter-flavored dog biscuit. You can imagine my surprise and dismay when Mom and Dad started dismantling that bouquet of roses without even letting me smell them! Next thing I knew they had them in a basket, they were nestling a bottle of rosé in the midst of them, and they pulled out their cameras without a single thought of me. It turns out that if there’s anything more adored in the wine world than me, it’s got to be rosé. Rosé has been enjoyed from every imaginable group throughout the past centuries from royal courts to millenials and everyone in between, and even though rosé has just recently found popularity in the modern wine world, it actually has quite a long and reputable history. When Greeks brought wine and vines to southern France in 600 B.C., they weren’t just bringing about the French vineyard, but they were introducing the type of wine that would eventually become adored around the world. The wine that the Greeks originally brought with them when they founded Marseilles in southern France had the same hint of color our modern rosés do but nowhere near the depth of complexity and flavor that we are blessed with today. During the Middle Ages, when the local monasteries begin to use wine as a source of income for their abbeys, wine making in that region saw a huge jump. By the 14th century, rosé had found its way into the most prestigious circles and was known as the wine of royalty. In more recent years, the production of rosé has continued to be refined by combining traditional and modern techniques and wines have increased in the their depth and complexity. Rosé can be made from a variety of different red grapes and it achieves its color through two different methods. The first, and the most common, is called maceration. In this method the juice is allowed to lay on the skins of the grapes for up to two days before draining it off and continuing with the fermentation process on the entire batch of juice. In the saignée style, just a portion of the juice that is being macerated for a red varietal is bled off after a couple of hours. The rest of the batch is used to produce the red varietal and the smaller amount of juice that is drained off the top is processed to become a rosé. This is not as common a method since it produces a smaller amount of juice from each batch, but it has the added benefit of making the flavors pop more in the red varietal from which it has been bled. 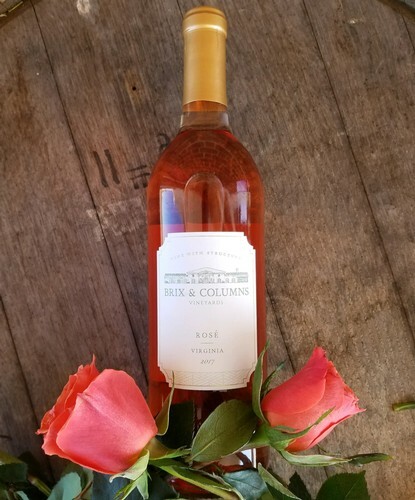 Very rarely, a winemaker will attempt to make a rosé by blending a white wine with a very small percentage of red wine, this method is frowned on by nearly all of the wine world. 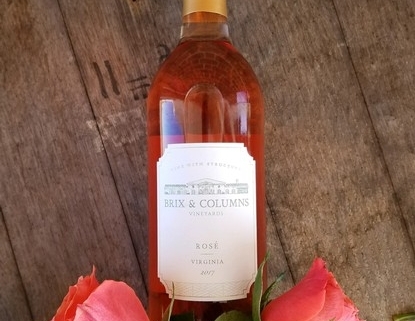 Here at Brix and Columns, our rosé is made by the latter method. It is commonly produced from a variety of reds, and then aged in a combination of both neutral French and stainless steel barrels. With the summer days quickly approaching, I can almost guarantee you that you will be spending a few hours on our patio sipping a delicious rosé and being greeted by the most wonderful winery dog there is: me! https://www.brixandcolumns.com/wp-content/uploads/2018/05/rosealldaypost.jpg 500 415 Stephanie Pence /wp-content/themes/sixpenny/images/logo.svg/ Stephanie Pence2018-04-11 17:15:142018-07-07 14:50:30Rosé All Day!! 2 Year Anniversary Celebration and Spring Vendor Fair!